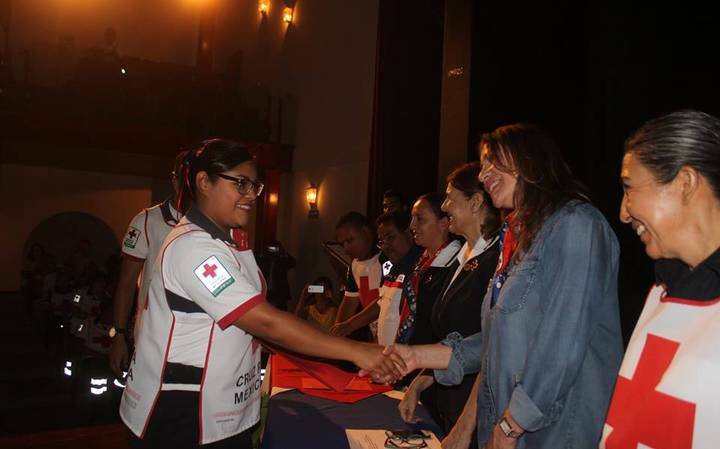 Emergency Medical Technicians of the San Miguel de Allende Red Cross (TUM), graduated a new generation of Medical Technicians that will provide their services in the San Miguel, Dolores Hidalgo and San Luis de la Paz area. Today the graduates are properly trained to offer prehospital service to the local population. The president of the Red Cross delegation of San Miguel de Allende, Leticia Fernandez said that these new Red Cross Medical Technicians will always follow, preach and extend the seven principles of the institution: Humanity, Neutrality, impartiality, independence, volunteering, unity and universality. The graduation ceremony was attended by Mrs. Leticia Fernández, president of the Board of Directors, Red Cross SMA; Mrs. Teri Kavanaugh, fundraising coordination; Dr. “Gualú”, State Emergencies Coordinator; Mrs. Maricela Almanza, Volunteer Coordinator; Mrs. Alma Bautista, coordinator of Women Volunteers, and Mrs. Gabriela López, from the Veterans Coordination.